In 1942, an Allied bombing in Lübeck, Germany, destroyed a famous 15th-century dance of death mural by artist Bernt Notke. As Halloween arrives, it offers a chance to delve into the occult, phantasmagoric, otherworldly, and haunted aspects of our world. In a series of posts, we’re exploring art history that offers a portal into a darker side of culture. On the night of March 28, 1942, the German city of Lübeck was bombed. In the destruction of the Allied attack, one of the most famous 15th-century depictions of death went up in flames. 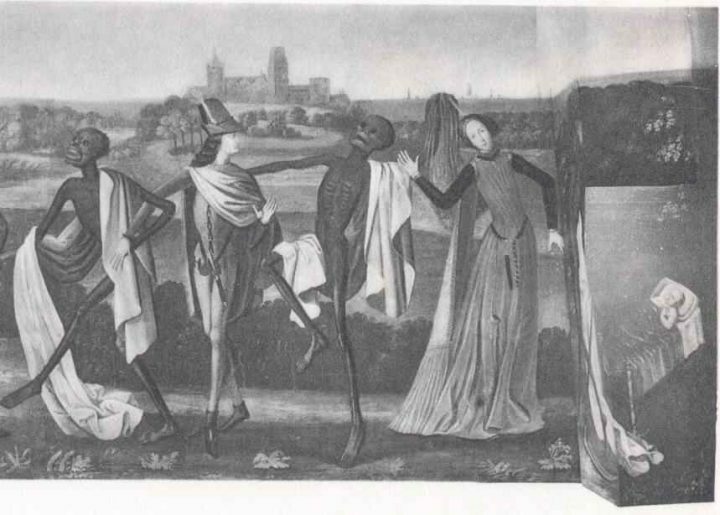 The “Danse Macabre” frieze at St. Mary’s Church in Lübeck was painted in 1463 by Bernt Notke. 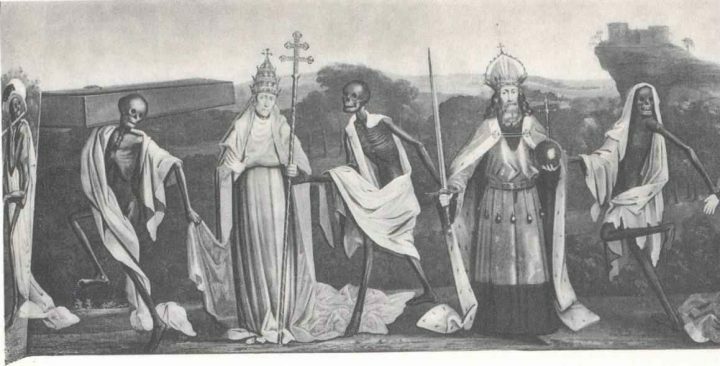 While it followed a tradition of these “dances of death” images that emerged in the second half of the 14th century, showing humans from all walks of life cavorting with skeletons, the Lübeck frieze was unparalleled. Stepping into a small chapel, the mural covered all four walls with 24 figures, arranged from pope and emperor to peasant and infant. The message wasn’t subtle — someday, no matter status, each of us will perish. And depicted in a life-size chain of movement, led by a skeleton with a flute, the work seemed to ask visitors to join in the dance. What made the Lübeck chapel especially interesting was the cityscape behind the dancers, with its ships and structures representing the surrounding area. 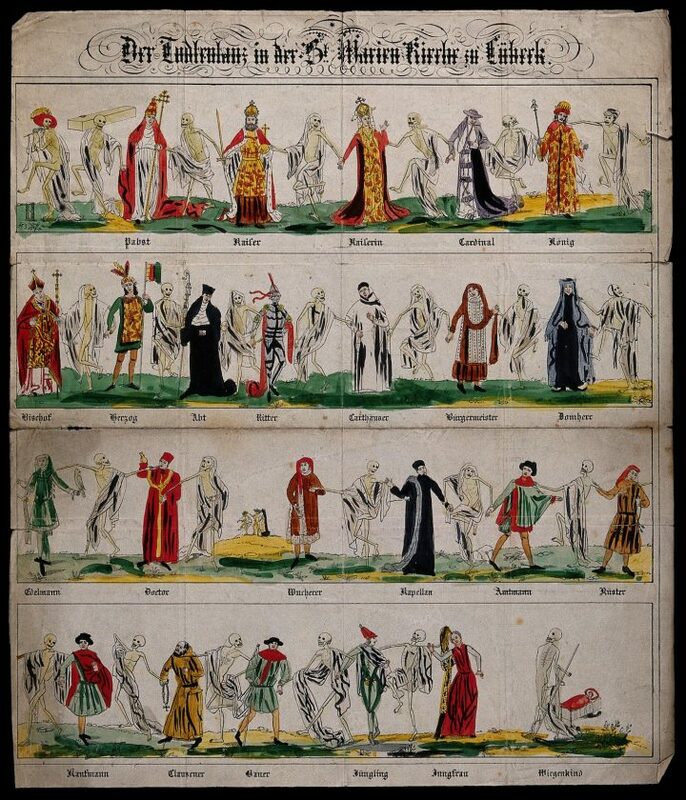 The popularity of the frieze means there are surviving, historic lithographs depicting its waltz of mortality, as well as striking black and white photographs (there’s even a full panorama of them viewable on Wikimedia). Another dance of death by Notke also survives in Tallinn, Estonia. In the 1950s, artist Alfred Mahlau designed two stained glass windows that pay tribute to the lost “Danse Macabre,” which are installed in the surviving structure of St. Mary’s. On the church’s floor is also a memento mori of sorts preserved from that night in 1942: the twisted, melted remains of the fallen church bells.